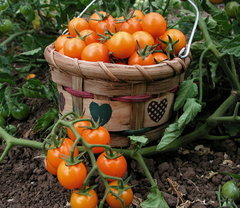 The Oregonian’Sun Gold’ cherry tomato is my very, very favorite.Seeds are a mystery to me. Well, not really a mystery. More like too much trouble. 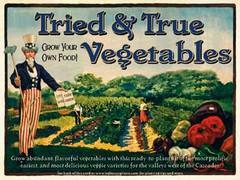 I’d rather plant vegetable starts right into the ground. No damping off, no thinning, no washing away the seeds while watering. (I know, mist with a sprayer. But when I stick my finger in there to see if it’s moist enough, I smash whatever seeds that may be miraculously germinating.) Most difficult of all is getting started soon enough to have plants big enough to transplant into the ground at the right time. I know buying plants is more expensive than growing them from seed. For those of you planting a large vegetable garden, it may be prohibitive. But since I feed only myself, I’ve turned to containers. Since I have a short attention span, I put them right outside my back door where I see them every day. Over the last Log House Plants’Miniature’ bell pepper is so pretty with red, green and yellow fruit all at once. couple of years, certain veggies have performed amazingly; others not so much. For instance, cilantro, which is my No. 2 favorite herb after basil, is a heart breaker. I try and try and fail and fail. This winter I consulted with David Kobos, the best edible gardener I know. He’s given up on cilantro, too. That makes me feel better. Some vegetables and fruits do really well, though, and I’ve settled on those for my yearly crop. The incomparable ‘Sun Gold’ tomato is one of them. Such sweet bliss. Only about 12 of those little cherries made it into the house last year. All the rest I popped in my mouth every time I walked by. Basil: I don’t stick with one variety because all the ones I’ve tried have done well, but this year I’ll try ‘Aristotle’ on the recommendation of Alice Doyle, the ever-so-enthusiastic and knowledgeable co-owner of Log House Plants. She says ‘Genovese’ is the best for the Northwest. And then there’s ‘Puck,’ named after the mischievous character in “A Midsummer Night’s Dream.” That’s a good enough reason in my book to grow it. ‘Lemon’ cucumber: Big cucumbers are good, but these small, citrusy sweet ones don’t get woody and tasteless when I forget to pick them. 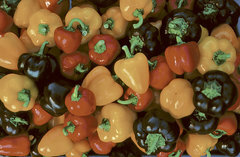 ‘Miniature’ bell peppers: Really, really pretty and just the right size for one. I eat them whole. ‘Blue Lake’ green beans: Not so unusual, but, like ‘Sun Gold,’ I can’t live without it. Petit Posy: A brand-new vegetable that a cross between kale and Brussels sprouts — seriously! Apparently, the plant has a stalk like brussels sprouts and frilly buttons that taste like kale. I gotta try this sucker. ‘Desert King’ fig: I’ve been told by many that this is the best fig. If I had the room, I’d grow an orchard of every type, but I’ll start with this one. And, yes, they grow in containers. ‘Sweet Chocolate’ heirloom pepper: I think the name says it all. ‘Black Krim’ or ‘Cherokee Purple’ heirloom tomatoes: In addition to ‘Sun Gold’ cherry, I always grow one slicer. Since both of these were listed as favs by experts in today’s Homes & Gardens, I’ll choose one. ‘Misono’ or ‘Envy’ edamame bean: If there was an edamame-eating contest, I would win. ‘Savor’ charentais melon: This is a for-sure. The first time I tried a charentais (the true cantaloupe), I thought I would faint. Alice says this one is small enough that the vines will support the baseball-size fruit. Oh my god, I can hardly wait. More recommended by Alice Doyle (retailers listed at the website, but basically their plants are at every garden center in Oregon and Washington). ‘Mexican’ sour gherkin: When he appeared on Rachel Ray’s TV show, Rocco DiSpirito put this veggie on his 2010 Top 10 list of must-try foods. Don’t know why that impresses me so much, but think how many people saw that! So much fruit, it looks like jewelry hanging on the vine. Kale: Any of them. Great because they’ll last through the winter. ‘Corno di Toro’ red or yellow Italian sweet pepper: Alice says everyone wants them, so I guess I do, too. One more thing, Log House has the coolest program called Grab & Grow. They’ve put together seven collections, including tried and true, heirloom, small space and pesto garden vegetables. The varieties in each collection are adjusted for different regions such as valleys west of the Cascades, the coast and Southern Oregon. Check it out on the website. There’s lots of information, including links to other resources. Look for recipes, too. Actually, that wasn’t the last thing. I’m looking for your plant suggestions, tips, questions and photos. We’ll be printing them in Homes & Gardens.